References DELETEP, m_pStyleTree, and stopUpdater(). References AV_CHG_HDRFTR, AV_CHG_MOTION, XAP_Dialog_Modeless::getActiveFrame(), XAP_Frame::getCurrentView(), getCurStyle(), FV_View::getPoint(), FV_View::notifyListeners(), and FV_View::setStyle(). Referenced by AP_Win32Dialog_Stylist::_onCommand(), AP_UnixDialog_Stylist::event_Apply(), and AP_Win32Dialog_Stylist::s_treeProc(). References UT_Worker::getInstanceData(), updateDialog(), and UT_return_if_fail. Referenced by Apply(), AP_Win32Dialog_Stylist::setStyleInGUI(), and AP_UnixDialog_Stylist::setStyleInGUI(). Referenced by AP_Win32Dialog_Stylist::_fillTree(), AP_UnixDialog_Stylist::_fillTree(), AP_Win32Dialog_Stylist::_styleClicked(), AP_Win32Dialog_Stylist::setStyleInGUI(), AP_UnixDialog_Stylist::setStyleInGUI(), AP_UnixDialog_Stylist::styleClicked(), and AP_CocoaDialog_Stylist::styleClicked. Referenced by AP_Win32Dialog_Stylist::setStyleInGUI(), and AP_UnixDialog_Stylist::setStyleInGUI(). 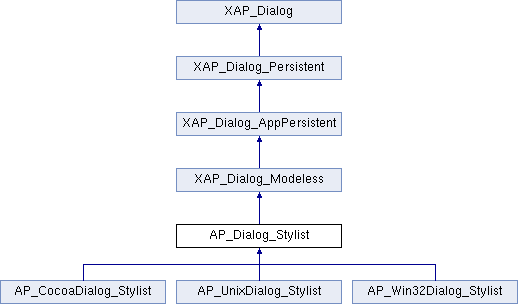 Implemented in AP_CocoaDialog_Stylist, and AP_UnixDialog_Stylist. References XAP_Dialog_Modeless::getActiveFrame(), XAP_Dialog_Modeless::notifyActiveFrame(), and updateDialog(). References XAP_Dialog::getApp(), XAP_App::getLastFocussedFrame(), and setSensitivity(). Referenced by AP_CocoaDialog_Stylist::notifyActiveFrame, and updateDialog(). Referenced by AP_Win32Dialog_Stylist::_styleClicked(), AP_Dialog_FormatTOC::getNewStyle(), AP_UnixDialog_Stylist::styleClicked(), and AP_CocoaDialog_Stylist::styleClicked. Referenced by AP_Win32Dialog_Stylist::_fillTree(), and AP_UnixDialog_Stylist::_fillTree(). Referenced by AP_Win32Dialog_Stylist::_onCommand(), and AP_UnixDialog_Stylist::runModal(). References autoUpdate(), m_pAutoUpdater, UT_Timer::set(), UT_Timer::start(), and UT_Timer::static_constructor(). Referenced by AP_UnixDialog_Stylist::runModeless(), and AP_CocoaDialog_Stylist::runModeless. References DELETEP, m_pAutoUpdater, and UT_Timer::stop(). Referenced by finalize(), and ~AP_Dialog_Stylist(). This method actually updates the dialog, in particular the style Tree and the current style. References Stylist_tree::buildStyles(), XAP_Dialog_Modeless::getActiveFrame(), XAP_Frame::getCurrentView(), FV_View::getDocument(), getNumStyles(), FV_View::getPoint(), FV_View::getStyle(), PD_Document::getStyleCount(), AV_View::getTick(), m_bIsModal, m_bStyleChanged, m_bStyleTreeChanged, m_iTick, m_pDoc, m_pStyleTree, m_sCurStyle, setAllSensitivities(), setStyleInGUI(), and UT_UTF8String::size(). Referenced by AP_Win32Dialog_Stylist::_fillTree(), AP_UnixDialog_Stylist::_fillTree(), autoUpdate(), setActiveFrame(), AP_Win32Dialog_Stylist::setStyleInGUI(), and AP_UnixDialog_Stylist::setStyleInGUI(). Referenced by AP_UnixDialog_Stylist::_constructWindow(), AP_Win32Dialog_Stylist::destroy(), AP_Win32Dialog_Stylist::runModal(), AP_UnixDialog_Stylist::runModal(), AP_Win32Dialog_Stylist::runModeless(), and updateDialog(). Referenced by getNumStyles(), updateDialog(), and ~AP_Dialog_Stylist().